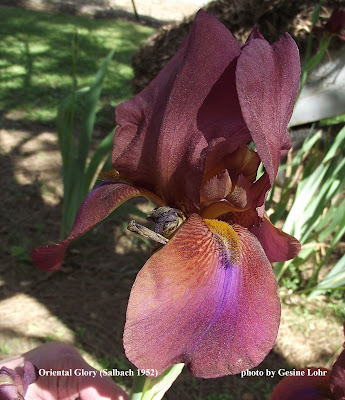 Carl Salbach is the third, and perhaps least known, of the early San Francisco Bay Area iris hybridizers, along with Sydney B. Mitchell and William Mohr, whom I have covered in some of my previous blogs. In addition to being an award-winning iris hybridizer himself, Salbach introduced iris for many other hybridizers, including many of the most important varieties of the early and mid-20th century. Although iris were his primary horticultural interest, early in his career he also hybridized dahlias and gladiolus. 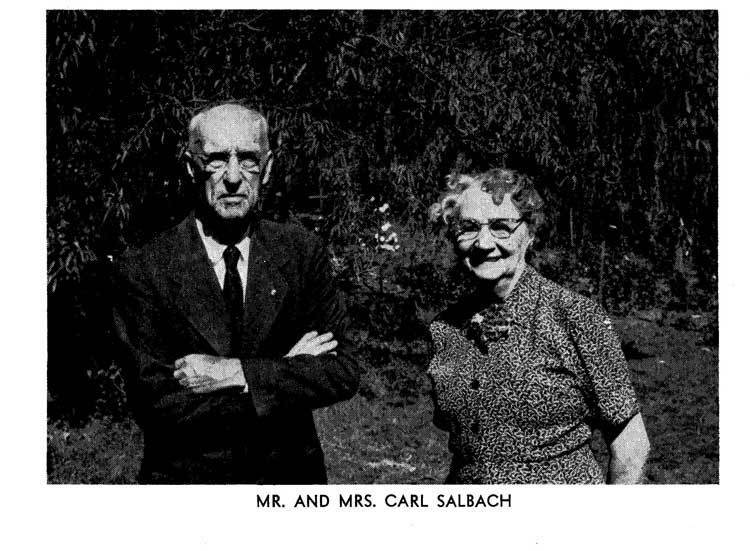 Carl Salbach was born on a ranch near Stockton, California in 1870, one of seven children of Edward and Katherine Salbach, who left their native Germany to settle in California's central valley. After graduating high school he served as the Deputy County Clerk for seven years, before moving on to the field that occupied his interest for much of his early years, the selling of typewriters. He worked for, managed, and owned typewriter companies in San Francisco and Los Angeles. While living in Oakland (across the bay from San Francisco), his growing interest in horticulture led to him publishing his first plant catalog (devoted to dahlias and gladiolus) in 1922. 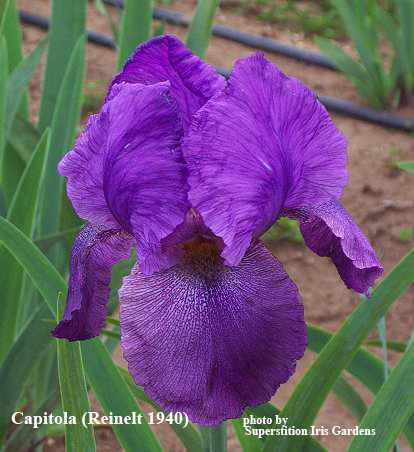 Around this same time period he first was introduced to modern tall bearded iris, and he so enthusiastically embraced iris that he offered his first iris catalog just two years later in 1924. This first catalog had nine of William Mohr's varieties. At this same time Sydney B. Mitchell established his Campos Altos Iris Gardens in the nearby Berkeley hills, but soon found that running an iris business left him little time to pursue his hybridizing activities. In 1925 he sold 4.5 acres of his land and all of his commercial iris stock to Salbach, who moved his office to the Woodmont Avenue location. His 1925 catalog included 23 Mohr introductions, including the important early arilbred iris 'William Mohr', which sold for the princely (for the time) sum of $50.00! Salbach began introducing his own hybrids in 1933. 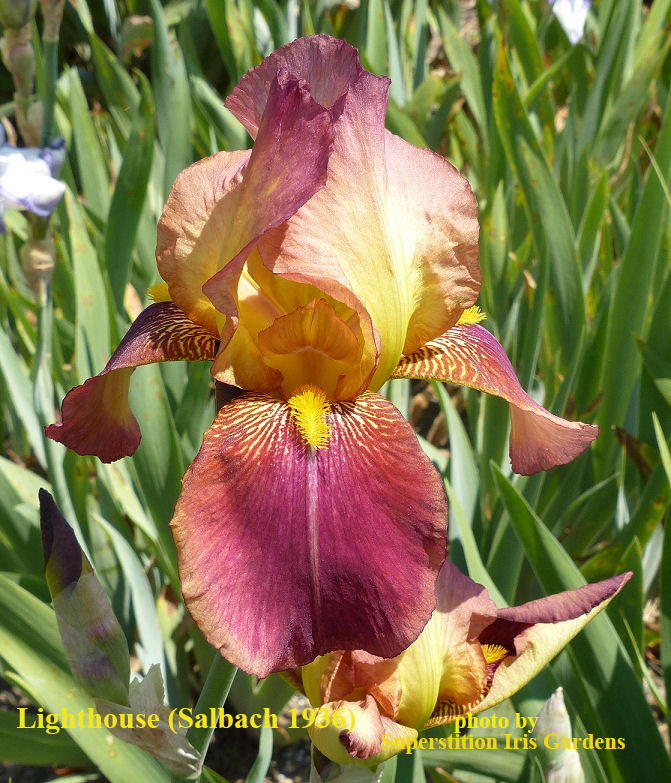 From the start they began winning awards, and in 1944 Salbach was awarded the American Iris Society's Gold Medal for Achievement in Hybridizing, on the strength such introductions as 'Golden Majesty', 'Deep Velvet', 'Radiant', and 'Lighthouse'. In 1939 he introduced Clara B. Rees' 'Snow Flurry', one of the most important advances in tall bearded iris in the early 20th century, with unprecedented ruffling and form. 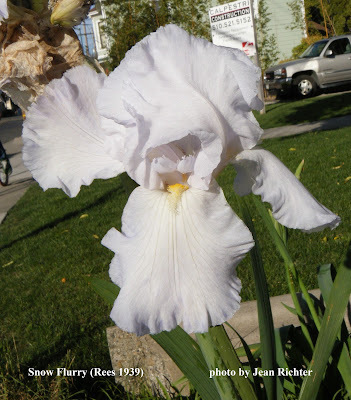 'Snow Flurry's importance as a parent in hybridizing led to it being referred to as the "Queen Mother of the Iris World." Local legend has it that Ms. Rees' sister Ruth cut several of its flowers, securing them with tissue paper in a shoebox, and made an all-day journey by train, ferry, and trolley all the way from San Jose to Salbach's home in the Berkeley hills. Upon seeing the magnificent flower Salbach was so amazed that, after seeing the plant in Rees' San Jose garden, he bought her entire stock on the spot. Among the hybridizers that Salbach introduced for was Frank Reinelt. In 1940, he introduced Reinelt's important arilbred iris 'Capitola'. Apparently Reinelt was so disappointed by the cross (the parents were 'William Mohr' and 'IB-Mac', one of the first arilbred iris), that he considered throwing it away! Luckily for the iris world he did not, as 'Capitola' is a major parent in arilbred breeding. In 1943 Salbach introduced one of his finest creations, the arilbred 'Lady Mohr'. This variety went on to win the Honorable Mention and Award of Merit, and many thought it deserving of the Dykes Medal as well, though it was not given that honor. This iris is a good example of Salbach's well-thought-out and planned approach to hybridizing (unlike the hit-or-miss methods of many of his contemporaries). 'Lady Mohr' was the result of a direct effort to produce a light-colored "Mohr" type iris from Capitola. The pod parent was chosen for its form, color, and ability to yield seedlings from hard-to-take crosses (a common problem when working with arilbred iris). The last year Salbach introduced his own creations was 1952, and he saved one of the best for last in 'Oriental Glory'. This striking iris has great garden impact. It's a difficult iris to photograph well, as the blue blaze beneath its beard can be tough to capture correctly. While iris were his main focus, Salbach also introduced a number of other plants. Along with the aforementioned dahlias and gladiolus, he introduced Reinelt's strain of delphiniums (which were to become world famous as the Pacific Hybrids). He also sold seed of Sydney B. Mitchell's hybrid broom (Cytisus), as well as Iceland poppies and helianthemums. Salbach received a number of awards for iris as well as other plants. As well as the AIS Gold Medal, he received the Foster Memorial Plaque from the British Iris Society in 1948. In 1945 he received the Gold Medal of the New England Gladiolus Society for his work in hybridizing gladiolus, and in 1948 received the Achievement Award of the North American Gladiolus Council for "meritorious work in promoting and bettering gladiolus." In 1933 Salbach took out the first plant patent to be given to a gladiolus for his introduction 'Golden Goddess'. He patented six gladiolus in all, and was so successful that he announced he was going to patent Clara B. Rees' iris 'Snow Flurry' and his own 'Deep Velvet'. For some reason (perhaps the difficulty of controlling the patents) he never actually did file the patents, which would have been the first filed for iris. Salbach worked with other types of iris besides tall bearded and arilbreds, growing and selling numerous other kinds of iris and introducing a dwarf iris. He also hybridized Dutch iris. At one time a representative from the Dutch bulb growers visited his garden, and upon seeing several of his Dutch iris seedlings, asked if he would sell them. Salbach replied (probably in an effort to end the conversation) that they were for sale that day only and for $1000. Much to his surprise, the representative immediately handed him a check for that amount! Salbach married Ella Stockwell in 1900, and their only child Edward was born in 1907. Edward was as keenly interested in iris as his father, and had begun taking on an important share of the management of Salbach Gardens when his life was tragically cut short in an automobile accident in 1939. Without a second generation to continue the management of the business, Carl Salbach retired and closed down the garden in 1959 and the acreage was subdivided for housing (which had already begun to encroach on the area). As Roy Oliphant noted in his appreciation of Salbach in the 1960 AIS Bulletin, "It seems a great loss to those of us who remember the many fine things that came from his gardens, and who remember the beauty of the gardens themselves with their fields of iris, the banks of wildlings, the great bushes of fragrant rhododendrons, the superb spectacle of the flowering cherries in full bloom and who, above all, remember Carl in his garden." Carl Salbach passed away November 2, 1962, after a massive heart attack just before his 92nd birthday. His legacy among iris enthusiasts is vast, both from iris he developed himself and those he introduced through his business. Without Carl Salbach, the great accomplishments of the early 20th century northern California hybridizers might never have been known.